The "Greatest Ever" squad chosen by more than 66,000 fans, in 2005. 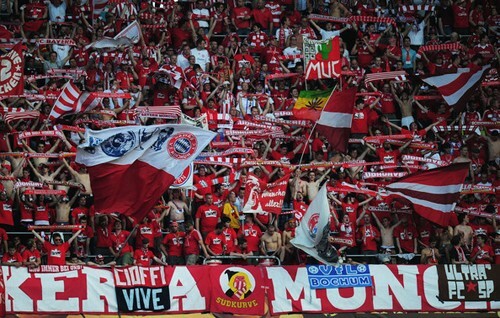 FC Bayern Munich was founded by members of a Munich gymnastics club (MTV 1879). 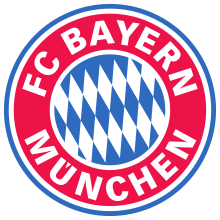 When a congregation of members of MTV 1879 decided on 27 February 1900 that the footballers of the club would not be allowed to join the German Football Association (DFB), eleven members of the football division left the congregation and on the same evening founded Fußball-Club Bayern München. Within a few months Bayern achieved high-scoring victories against all local rivals and reached the semifinals of the 1900–01 South German championship. 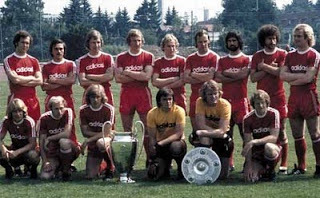 In the following years the club won some local trophies and in 1910–11 Bayern joined the newly founded "Kreisliga", the first regional Bavarian league. They won this league in its first year, but did not win it again until the beginning of World War I in 1914, which halted all football activities in Germany. In the years after the war, Bayern won several regional competitions, before winning their first South German championship in 1926, an achievement repeated two years later. 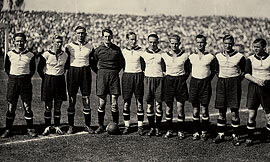 Their first national title was gained in 1932, when coach Richard "Little Dombi" Kohn led the team to the German championship by defeating Eintracht Frankfurt 2–0 in the final. The advent of Nazism put an abrupt end to Bayern's development. The president and the coach, both of whom were Jewish, left the country. Many others in the club were also purged. Bayern was taunted as the "Jew's club" and as a semi-professional club Bayern was also affected by the ruling that football players had to be full amateurs again. In the following years Bayern could not sustain its role of contender for the national title, achieving mid-table results in its regional league instead. After the war Bayern became a member of the Oberliga Süd, the southern conference of the German first division, which was split five ways at that time. Bayern struggled, hiring and firing 13 coaches between 1945 and 1963. 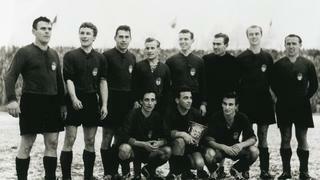 In 1955 they were relegated, but returned to the Oberliga in the following season and won the DFB-Pokal for the first time, beating Fortuna Düsseldorf 1–0 in the final. The club struggled financially though, verging on bankruptcy at the end of the 1950s. Manufacturer Roland Endler provided the necessary funds and was rewarded with four years at the helm of the club. In 1963 the Oberligas in Germany were consolidated into one national league, the Bundesliga. Five teams from the Oberliga South were admitted. Bayern finished third in that year's southern division, but another Munich team, TSV 1860 Munich, had won the championship. As the DFB preferred not to include two teams from one city, Bayern was not chosen for the Bundesliga. They gained promotion two years later, fielding a team with young talents like Franz Beckenbauer, Gerd Müller, and Sepp Maier — who would later be collectively referred to as the axis. In their first Bundesliga season Bayern finished third and also won the German cup. This qualified them for the following year's European Cup Winners' Cup, which they won in a dramatic final against Scottish club Rangers, when Franz "the Bull" Roth scored the decider in a 1–0 extra time victory. 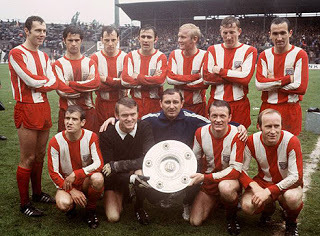 In 1967 Bayern retained the cup, but slow overall progress saw a new coach, Branko Zebec take over. He replaced Bayern's offensive style of play with a more disciplined approach, and in doing so achieved the first league and cup double in Bundesliga history, using only 13 players throughout the season. Udo Lattek took charge in 1970. After winning the cup in his first season he led Bayern to their third German championship. 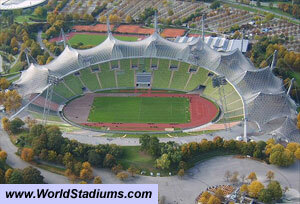 The deciding match in the 1971–72 season against Schalke 04 was the first match in the new Olympic Stadium, and was also the first live televised match in Bundesliga history. Bayern beat Schalke 5–1 and thus claimed the title, also setting several records, including points gained and goals scored. Bayern also won the next two championships, but the zenith was their triumph in the European Cup final against Atlético Madrid, which Bayern won 4–0 after a replay. During the following years the team was unsuccessful domestically, but defended their European title by defeating Leeds United in the final when Roth and Müller secured victory with late goals. A year later in Glasgow, AS Saint-Étienne were defeated by another Roth goal and Bayern became the third club to win the trophy in three consecutive years. The final trophy won by Bayern in this era was the Intercontinental Cup, in which they defeated Brazilian club Cruzeiro over two legs. The rest of the decade was a time of change and saw no further titles for Bayern. In 1977 Franz Beckenbauer left for New York Cosmos and in 1979 Sepp Maier and Uli Hoeneß retired while Gerd Müller joined the Fort Lauderdale Strikers. Bayerndusel was coined during this period as an expression of either contempt or envy about the sometimes narrow and last-minute wins against other teams. 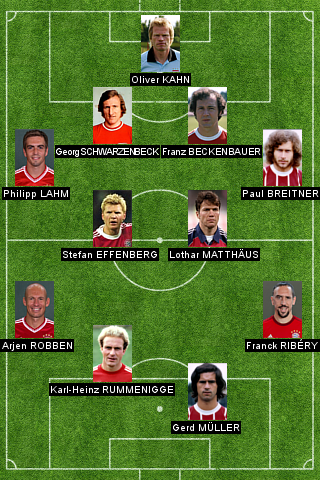 The 1980s were a period of off-field turmoil for Bayern, with many changes in personnel and financial problems. 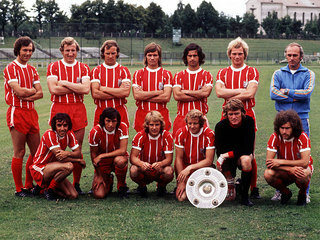 On the field, Paul Breitner and Karl-Heinz Rummenigge, termed FC Breitnigge, led the team to Bundesliga titles in 1980 and 1981. 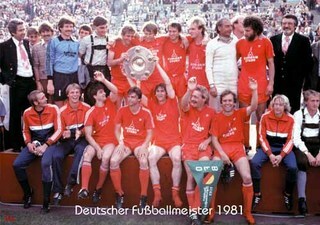 Apart from a DFB-Pokal win in 1982, two relatively unsuccessful seasons followed, after which Breitner retired and former coach Udo Lattek returned. 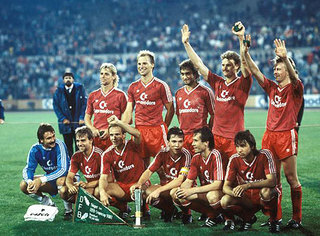 Bayern won the 1984 cup, then went on to win five championships in six seasons, including a double in 1986. However, European success was elusive during the decade; Bayern managed to claim the runners-up spot in the European Cup in 1982 and 1987. Jupp Heynckes was hired as coach in 1987, but after two consecutive championships in 1988–89 and 1989–90 Bayern's form dipped. 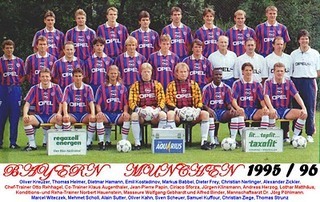 After a second place in 1990–91 the club finished just five points above the relegation places in 1991–92. In the season of 1992–93, Bayern Munich lost out in the UEFA Cup 2nd round to the (at the time) Premier League team Norwich City, who remain the only English football club to beat them at their former home ground the Olympic Stadium. Success returned when Franz Beckenbauer took over for the second half of the 1993–94 season, winning the Championship again after a four-year gap. Beckenbauer was then appointed club president. His successors as coach, Giovanni Trapattoni and Otto Rehhagel both finished trophyless after a season, not meeting the club's high expectations. During this time Bayern's players frequently appeared in the gossip pages of the press rather than the sports pages, resulting in the nickname FC Hollywood. Franz Beckenbauer briefly returned at the end of the 1995–96 season as caretaker coach and led his team to victory in the UEFA Cup 1995–96, beating Bordeaux in the final. For the 1996–97 season Giovanni Trapattoni returned to win the championship. But in the following season Bayern lost the title to the just promoted Kaiserslautern and Trapattoni had to take his leave for the second time. 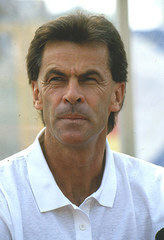 From 1998–2004 Bayern were coached by Ottmar Hitzfeld. In Hitzfeld's first season, Bayern won the Bundesliga and came close to winning the Champions League, losing 2–1 to Manchester United in injury time after leading for most of the match. The 1999–2000 season resulted in Bayern winning their third league and cup double. A third consecutive Bundesliga title followed in 2001, won in a finish on the final day of the league season. Days later, Bayern won the Champions League for the fourth time after a 25-year gap, defeating Valencia CF on penalties. The 2001–02 season began with a win in the International Cup, but ended trophyless otherwise. A season later Bayern won their fourth double, leading the league by a record margin. Hitzfeld's reign ended in 2004, with Bayern underperforming, including a cup defeat by second division Alemannia Aachen. Former Bayern coach Ottmar Hitzfeld returned to Munich in January 2007, but Bayern finished the 2006–07 season fourth, thus failing to qualify for the Champions League for the first time in more than a decade. Additional losses in the cup and the League Cup left the club with no honours for the season. For the 2007–08 season, Bayern Munich made drastic squad changes to help retool and rebuild. They signed a total of eight new players and sold, released or loaned out nine of their existing players. Hamit Altintop from Schalke 04, Luca Toni from ACF Fiorentina, Miroslav Klose from Werder Bremen, and record signing Franck Ribéry from Olympique Marseille headlined the signings. The new additions paid off, as the Reds went on to win the 2008 DFB-Pokal and the Bundesliga, being on top of the standings on every single week of play. On 11 January 2008 Jürgen Klinsmann was named as Hitzfeld's successor, taking charge on 1 July 2008. He signed a two year contract. During the first half of the 2008–09 Bundesliga season, Bayern got off to a rocky start, winning just two games until day six, but started to catch up afterwards. Bayer Leverkusen eliminated Bayern in quarter-finals of the DFB-Pokal. In the Champions League Bayern also reached the quarter-finals. They were eliminated by FC Barcelona after winning Group F and defeating Sporting Clube de Portugal in the first knockout round, achieving a Champions League record aggregate of 12–1. On 27 April, two days after a home defeat against Schalke which saw Bayern drop to the third place in the table, Klinsmann was fired. This was preceded by several disappointing results such as a 5–1 aggregate loss to Barcelona in the Champions League, and a 5–1 loss to champions-to-be VfL Wolfsburg. Former coach Jupp Heynckes was named as caretaker until the end of the season. Bayern eventually finished second, thus qualifying directly for the Champions League in 2009–10. Bayern then signed manager Louis Van Gaal for the 2009–10 season from AZ of Alkmaar. While under speculation due to a strand of poor results, Van Gaal managed to advance Bayern through to the round of 16 with a convincing 4–1 display over Juventus FC in Turin. They drew Fiorentina as their opponent in the round of 16 in the Champions League. On 9 March, they lost to Fiorentina 3–2 but advanced to the quarter-final on the away goals rule. In the quarter-final clash against Manchester United, Bayern achieved a similar score to their Fiorentina games, edging United 4–4 and progress to the semi-finals of the Champions League on away goals, with them winning 2–1 at home and losing 3–2 away. On 27 April 2010, Bayern beat Olympique Lyonnais 3–0 after winning 1–0 in the first leg. That result sent Bayern to the UEFA Champions League Final 2009–10. On 8 May 2010, FC Bayern won the 2009–10 Bundesliga after a 3–1 win at Hertha Berlin. Bayern also won the German Cup (DFB-Pokal) on 15 May 2010, thus securing the double. Bayern lost the 2010 UEFA Champions League Final 2–0 to Jose Mourinho's Inter Milan on 22 May 2010 in Madrid (Santiago Bernabeu Stadium). In the 2010–11 season they were eliminated in the first round of the UEFA Champions League knockout phase by Inter Milan by the away goals rule. Felix Magath took over and led Bayern to two consecutive doubles. 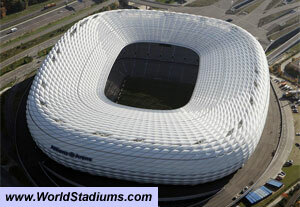 Prior to the start of the 2005–06 season, Bayern moved from the Olympic Stadium to the new Allianz Arena, which the club shares with 1860 Munich. On the field their performance in 2006–07 was erratic. Trailing in the league and having lost to Alemannia Aachen in the cup yet again, coach Magath was sacked shortly after the winter break. IMO Franck Ribery should replace Ballack in the first team. He has archieved so much with Bayern (especially last season) and has been more important for Bayern than Ballack ever was. What has Ballack done for Bayern? Playing four years, winning three times the double and scoring many goals. But what was then? 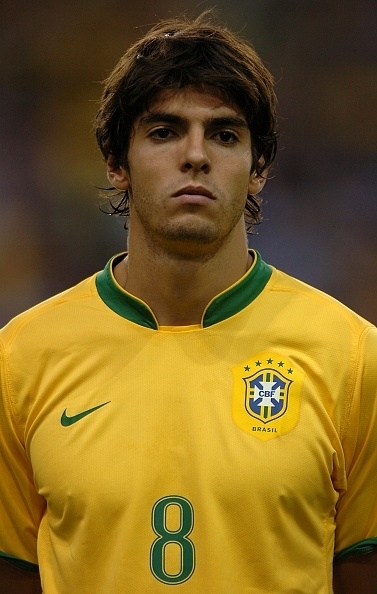 He rejected the club's offer for a new contract and joined Chelsea because they offered him more money. This shows that Ribery is also more effective than Ballack was at his Bayern days. So all in all there’s no reason while Ballack the mercenary should stay in the first team. Ribery is the best winger in the club’s history, is loved by all Bayern fans and finally deserves a place in the first team..
Ernst Nagelschmitz and Mark van Bommel should be in the reserves here. After the end of this season we could also think of adding Robben to the first team..
Well, now the season is over and I can only repeat this suggestion. Robben has become even better in the last two years (especially in TMW and extremely in MEN), scoring many important goals, including the winning goal in the CL final 2013. There's absolutely no way of not adding him in first team here..
How about adding Van Buyten to reserves... Honestly if Lucio is part of the reserves, Van Buyten who has won more trophies than Lucio must be there. Also I'd like to see Ludwig Hofmann in the reserves, he was one of the best wingers to play for the club but unfortunately illness took him away too early.. I can only agree with JeanMarc's post here, FC Bayern wouldn't be the same without him. Same goes for the other teams he coached (even Barca although a certain coke addict guy from Argentina ended his spell there way too early), especially Borussia Mönchengladbach..
Jerome Boateng can add in reserves? I would ask whether an update should be done on the list of players. Firstly, about Dieter BRENNINGER, I am really wondering why he will be in the starting 23. With respect to him, obviously, I have no clue that how he can compare with the legend like Muller, Rummenige or Elber. Can anyone explain this? Another thing, about LIZARAZU, I think he should have a place in the starting team- he is nominated as the member of the hall of the fame of FC Bayern, I think the players in the hall of fame should secure the place in starting 23. I think this first one played tons of matches, scored more or less 150 goals + was part of the if the first Bundesliga title..
And Goldbrunner played since when the dinosaurs were still wandering across the planet until the first cavemen appeared on Europe, so he's untouchable for make room for Lizarazu.